President Paul Kagame has shared Rwanda’s resilience in facing its challenges and later emerging into a progressive country 23 years after the horrible 1994 genocide against the Tutsi. 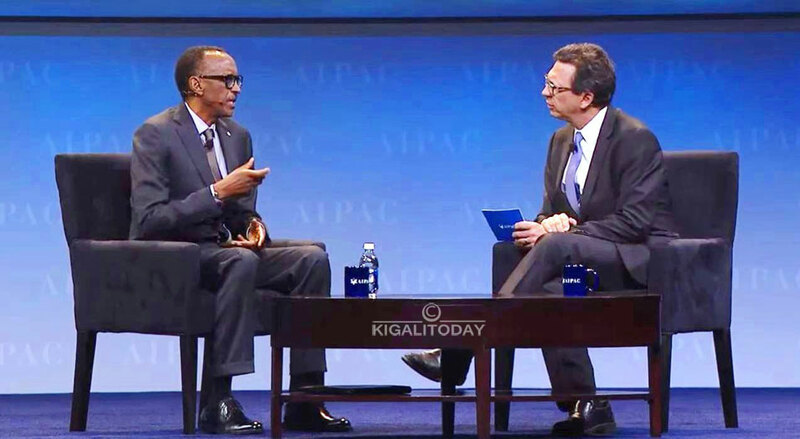 Kagame spoke Sunday at the American Israel Public Affairs Committee (AIPAC) policy conference in Washington DC. Kagame is the first African leader to address this high profile platform. The statement attracted a standing ovation from the 18,000 participants including 7,000 for their first time. 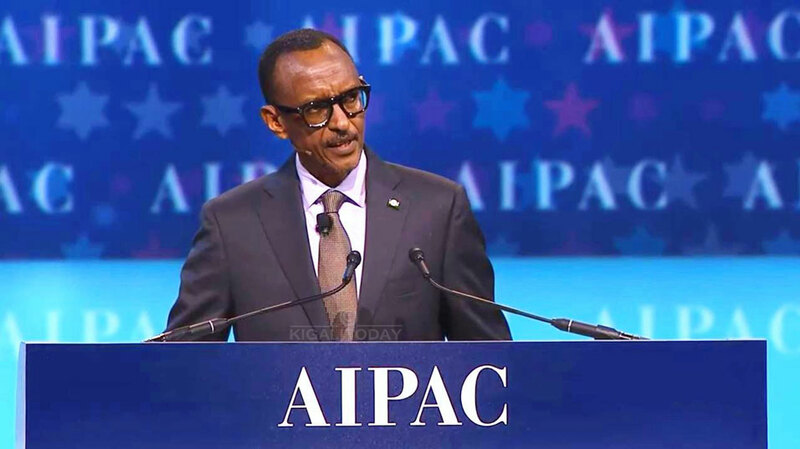 “Israel has a right to exist and thrive,” President Kagame said, attracting applause from a massive audience. He said that what Israel went through to achieve its current status is similar to what Rwanda is going through. Speaking about the relationship between Rwanda and Israel, Kagame said that there are a lot of opportunities being nurtured out of this friendship. “We are glad that Israel is back, engaging more fully with Africa,” he said. President Kagame said that having so much in common between Israelis and Rwandans has created so much love for each other as people with similar history. “Engaging with Israel has offered new horizons, and I want to take this moment once again to thank you,” he said. The address lasted about five minutes, was then followed by a scheduled Q&A conducted by CNN’s Frank Sesno – also the author of “Ask More”. Sesno asked President Kagame, “what do you learn from pages of Israel”. In May 2008, Kagame was in Israel where he participated in several events marking the 60th anniversary of establishment of the State of Israel. In July last year, Israeli Prime minister Benjamin Netanyahu broke a thirty-year old silence becoming the first Israeli prime minister to visit the continent in at least 30 years. Netanyahu met African leaders In Uganda and discussed further cooperation and business opportunities, in a special summit attended by President Kagame as well as leaders from Kenya, South Sudan, Ethiopia, Zambia and Tanzania. Netanyahu was also in Rwanda where several big deals were concluded. Kagame was also asked about a controversial UN resolution condemning Israel, which Rwanda abstained. Kagame said that Rwanda did not support the resolution on Palestinian statehood at UN because it did not allow parties involved to sit and agree. Before President Kagame walked to the stage, Yannick Tona – a survivor of the 1994 genocide against Tutsi delivered an emotional testimony that kept the entire audience very silent and attentive. Yannick was 4years when the genocide started. For him, growing up as a survivor left him bitter and angry. He has been to Israel on several occasions and an advocate of AIPAC. “I am a proud Rwandan, I am a survivor, and I am pro-Israel,” He said while ending his speech as the audience gave him applause. Diplomatic relations between Israel and African countries date back to the 1960s, but ties with most nations in the continent were severed in the wake of the 1973 Arab-Israeli war. Israel announced it was launching a $13m aid package to strengthen economic ties and cooperation with African countries and would also provide African states with training in “domestic security” and health. In October 23-27th , Africa and Israel will hold a big summit dubbed “The Africa-Israel Summit”. It will be convened in the Togolese capital Lome under the theme “Building bridges towards greater shared prosperity”. Organisers say this summit presents a framework that will permit the leaders of the trade, security and diplomatic sectors of Africa and Israel to meet, network and collaborate.